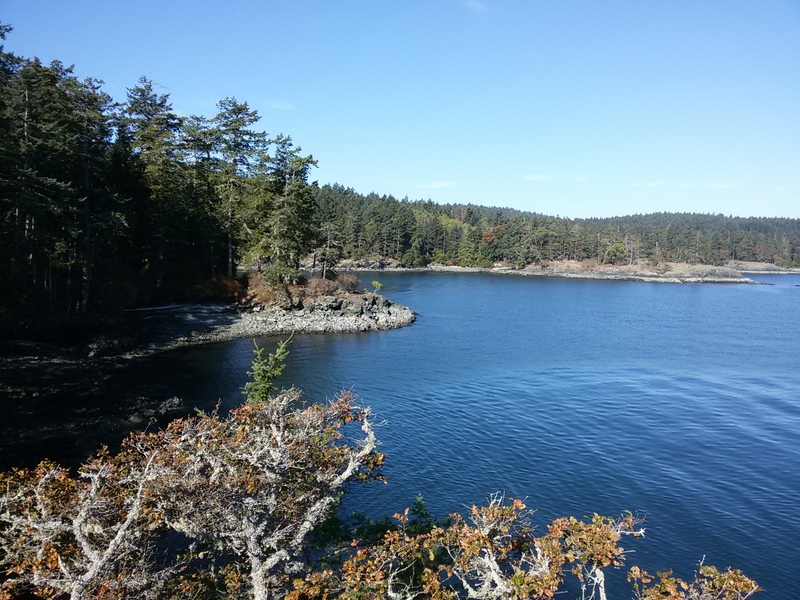 My previous post was about just one of my many overnight bike trips to one of the Gulf Islands, which have over many years included overnight camping at Ruckle Provincial Park on Saltspring Island scores of times. Why Ruckle? 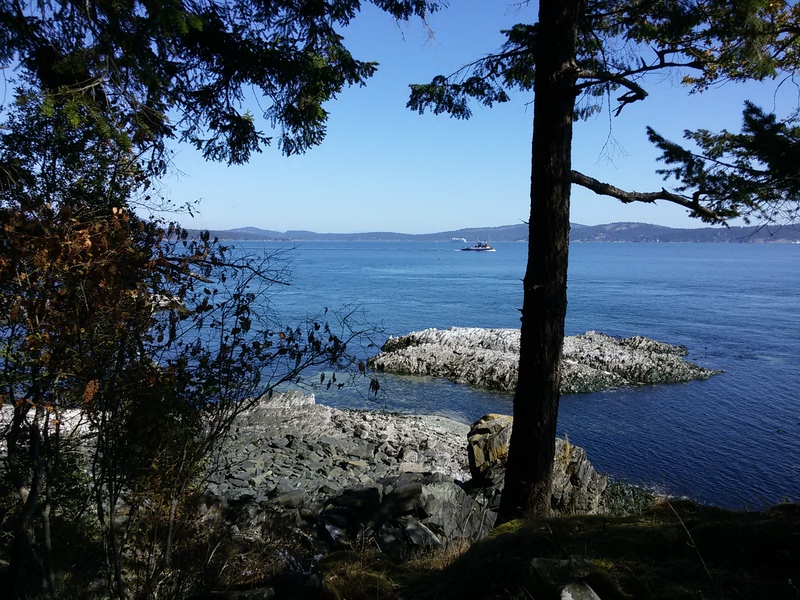 It’s an unbelievably scenic location, close to home and with over 70 walk/bike-in waterfront or water view sites it’s difficult to pass up an opportunity to go there. Admittedly, most of my visits to the park were over-nighters and usually at the beginning or end of a longer bike trip to other locales – and it is a great place to start or finish a tour! But an overnight visit, although enjoyable, usually only allowed for a short time to really explore this expansive park and area. So earlier this year I packed up the bike and camping gear for a two night trip. 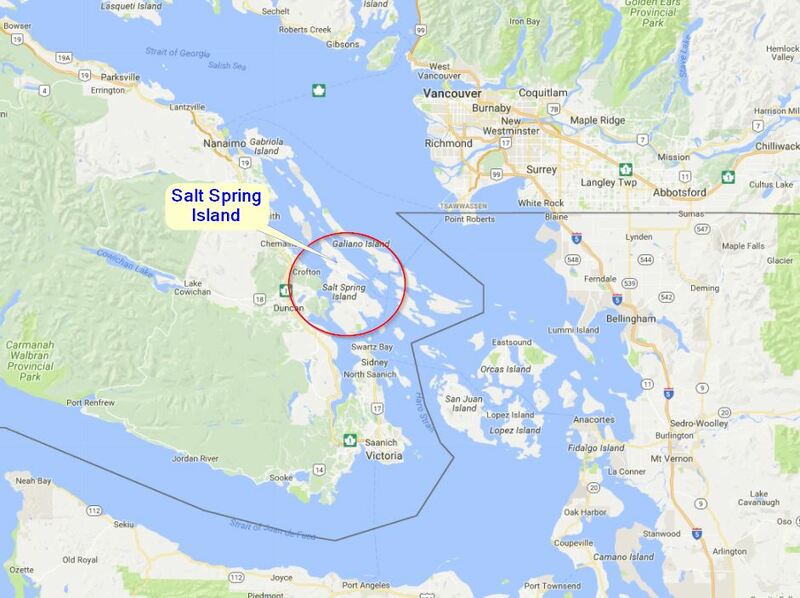 This meant packing enough supplies for two days, as the nearest stores are a relatively short distance away, but one has to navigate over Saltspring Island’s many hills to either Ganges or back to Fulford Harbour via some challenging hills (I say, “back to Fulford Harbour,” as that is where the ferry deposits you if arriving from Swartz Bay on Vancouver Island), so nowadays I elect to schlep the supplies there and stay put! No need to pack water though as all water at Ruckle Park is tested/treated and plentiful from three or four convenient locations throughout the park. 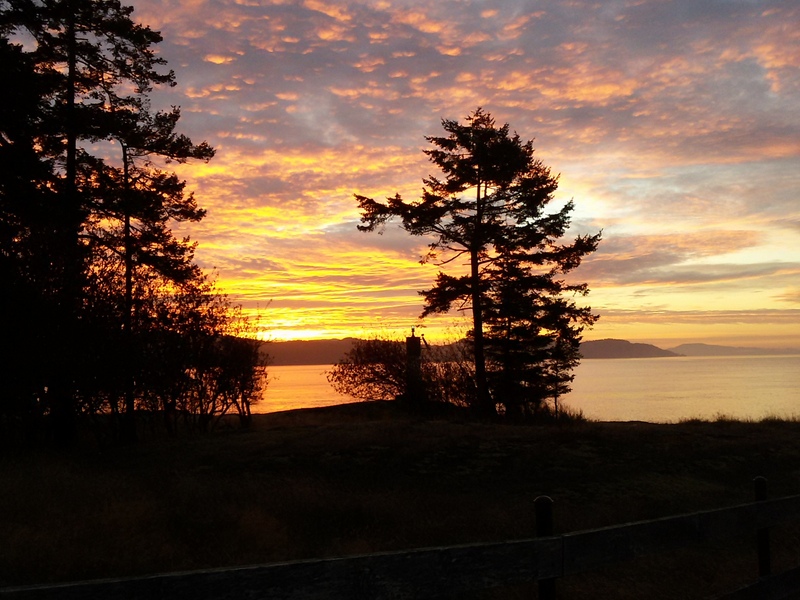 In addition to cycling to Ruckle, during the Summer months there is now limited bus service from Fulford Harbour to Ruckle Park – more information at BC Transit. On arrival at Fulford Harbour there is a small grocery store/food counter, decent restaurant and a couple of coffee shops. 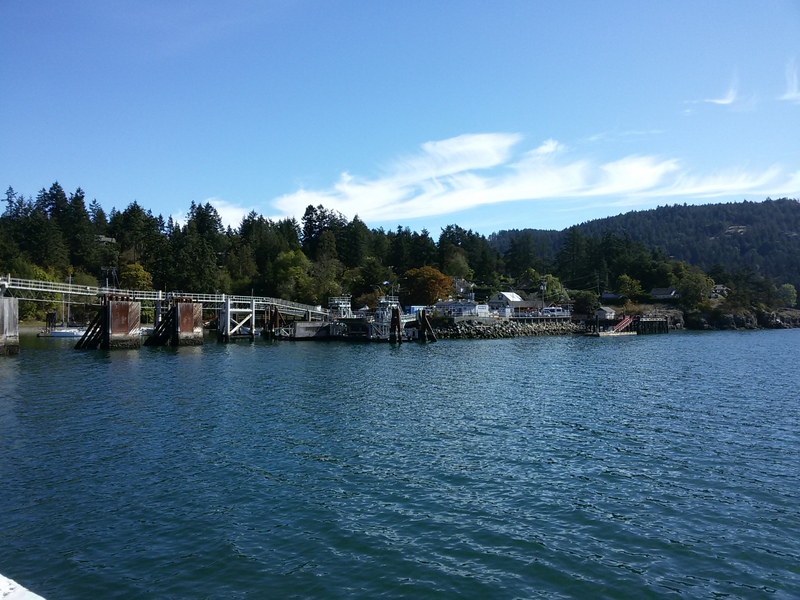 Then from the ferry dock it’s up a steep hill followed by a short pedal to the park, up and down more hilly terrain – about 10 km along Beaver Point Road. Ruckle Provincial Park is actually located at Beaver Point on the Island. If arriving mid-week (as is my preference) at Ruckle Provincial Park, then one has a good selection of sites to choose from. Otherwise on good weather weekends or holiday weekends, one might get “skunked!” However, many good-hearted campers may share a spot, especially so if they are also cyclists. I usually – no, always, manage to secure a good spot with good views over the ocean to the other close-by islands and vistas of the boat traffic cruising by. 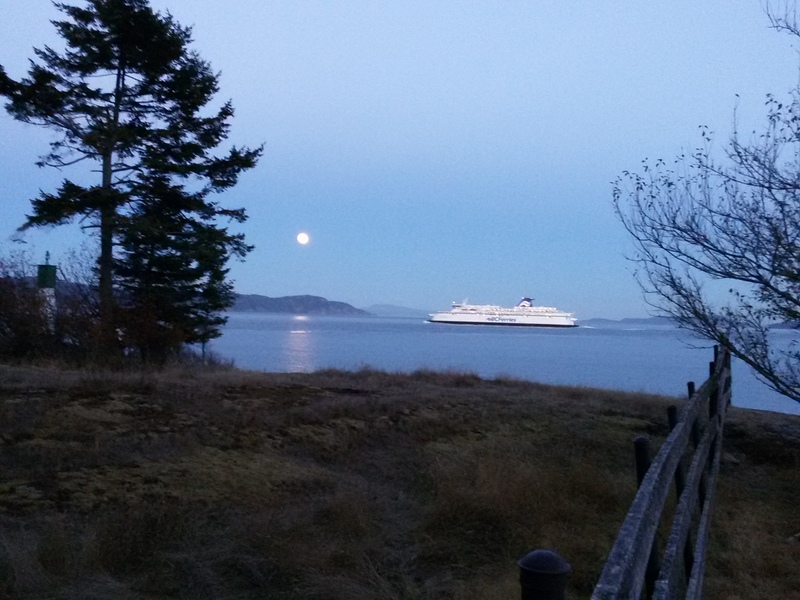 BC Ferries to Vancouver and the other Gulf Islands travel past the island frequently together with many pleasure craft including paddlers in kayaks, some of whom specifically paddle to Ruckle to camp. I set up camp and relaxed for the first afternoon, engaging in some reading and basically just enjoying the views. After a light supper, I walked around the camping areas and visited with some of the other campers and cyclists that were out enjoying the evening. The next morning I made coffee and breakfast then got a few things together readying myself for some hiking on the park trails. 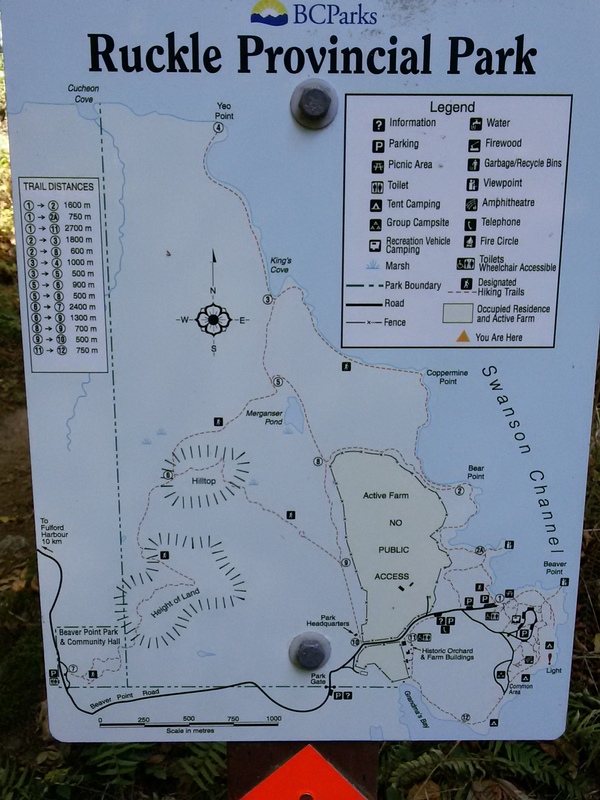 The previous evening on my wanderings, I studied the park trail map that is posted on a few information centres around the park and decided on the best trail to tackle. As I enjoy the waterfront so much, the consensus was to head north on the trail that is adjacent to the shoreline in many places, then loops around the farm. I had been to the start of this particular trail on a previous occasion, but had only walked a short distance then and surmised that exploring the rest of the trail would be a very scenic experience; I wasn’t disappointed! 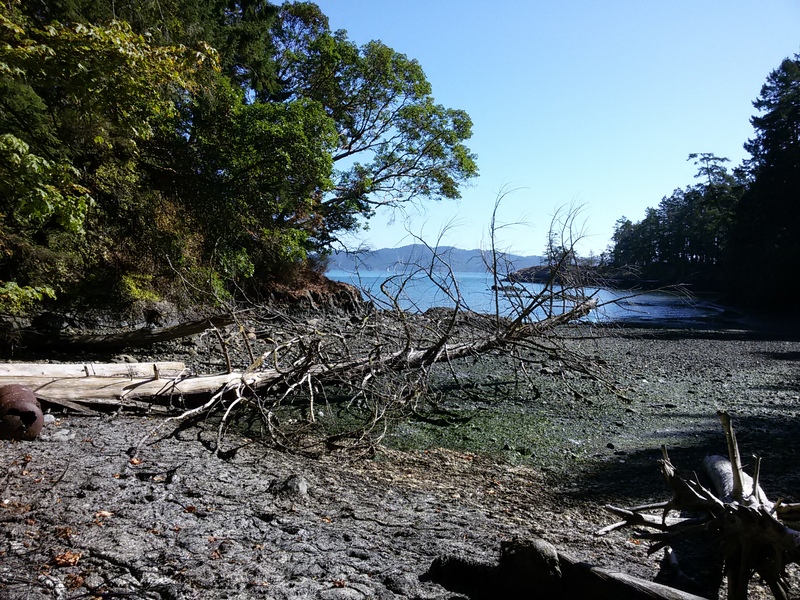 For the first section of the trail there is defined direction on a dirt path or one can elect to take to the adjacent beach route which requires a little bit of rock scrambling. After carefully negotiating the rocky shoreline with some slippery seaweed covered areas, I had to make my way back up to the dirt trail and follow that as best I could – there are some rudimentary small orange trail markers periodically, but it’s somewhat hard to spot them at times. 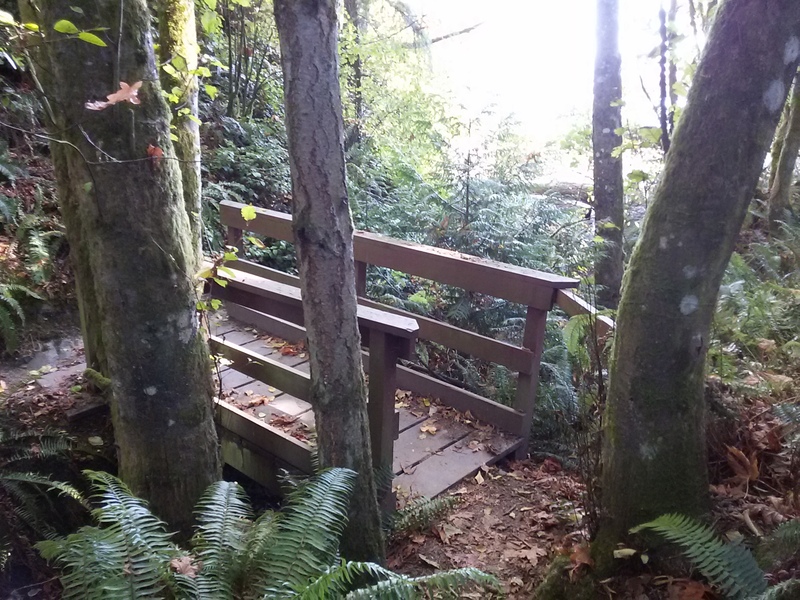 Every so often the trail heads into forested areas of the park en route to another waterfront area. 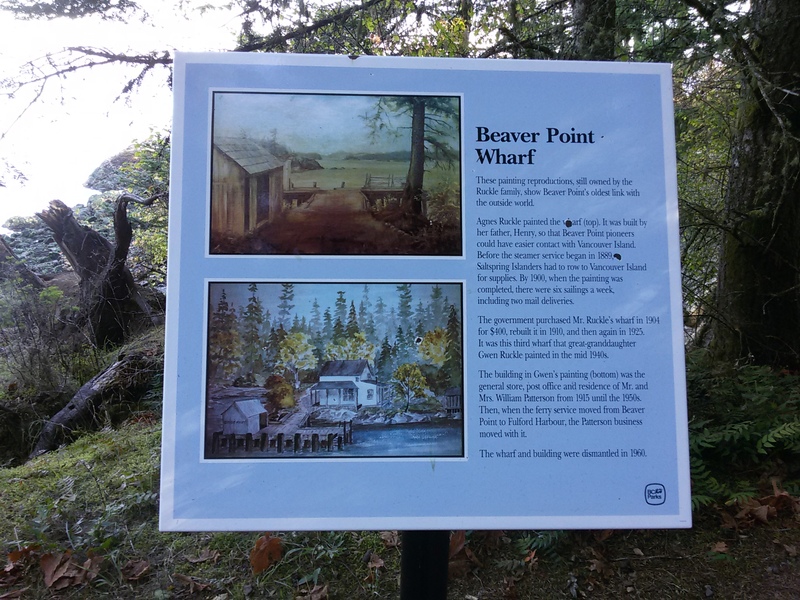 An historic marker/sign along the route describes that in days gone by, the Saltspring Island Ferry docked at Beaver Point Wharf rather than its present venue of Fulford Harbour. 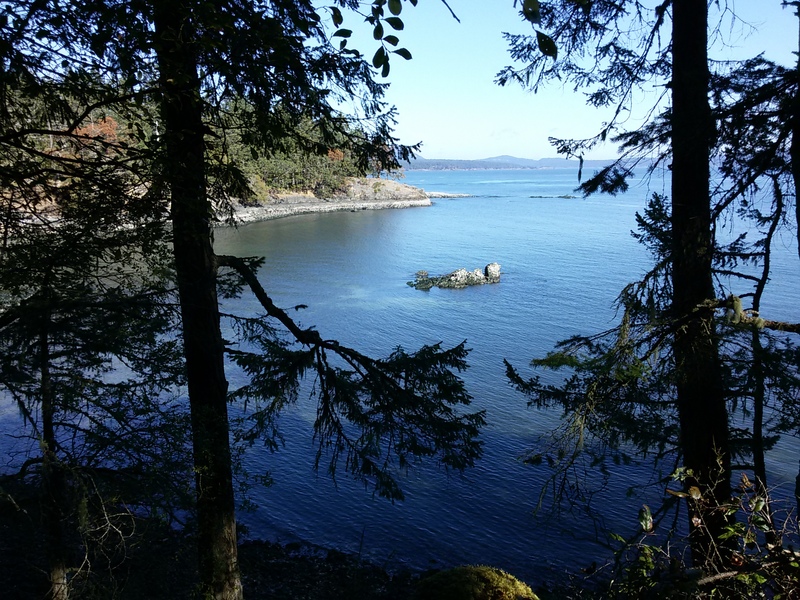 As I hiked farther and farther along the trail, I had many views of very peaceful “secret coves” that peeked out from between trees and around corners. 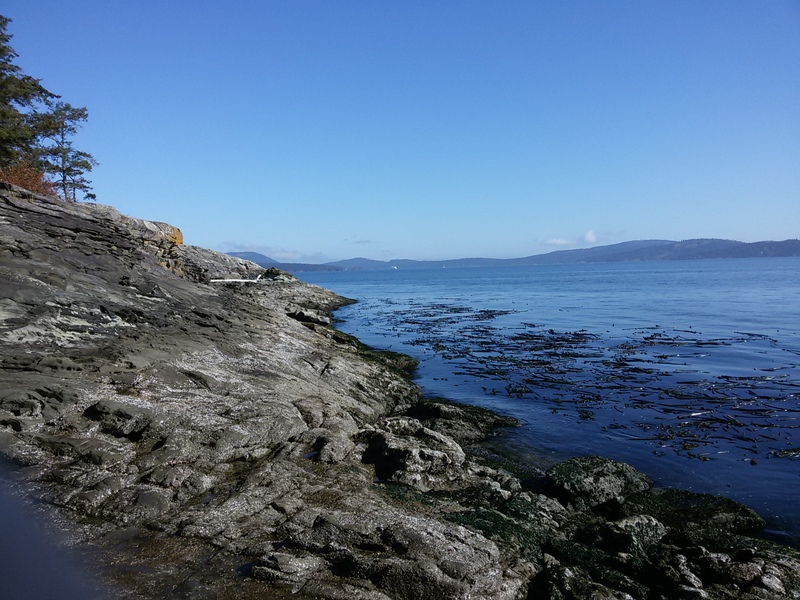 Not all coves were accessible though and I was surprised a the lack of maintenance to critical areas. 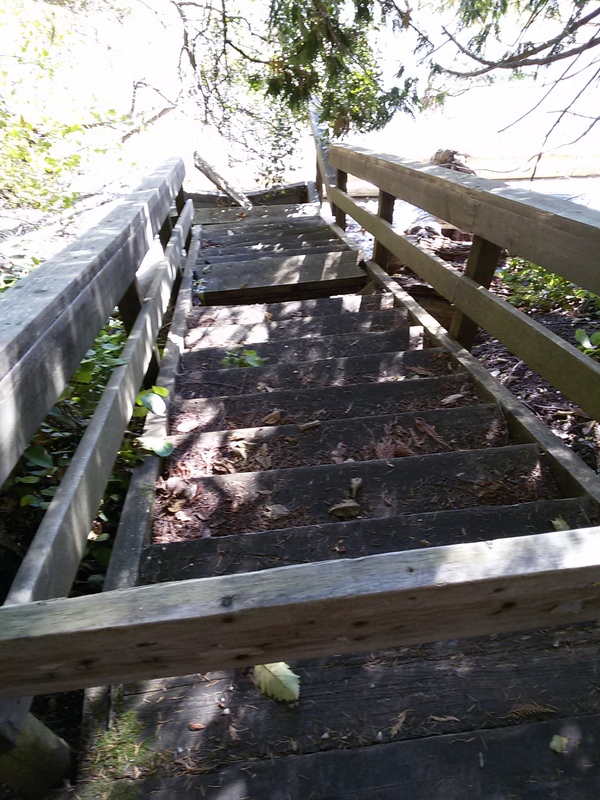 One such stairway merely had a board nailed across the top to prevent access. 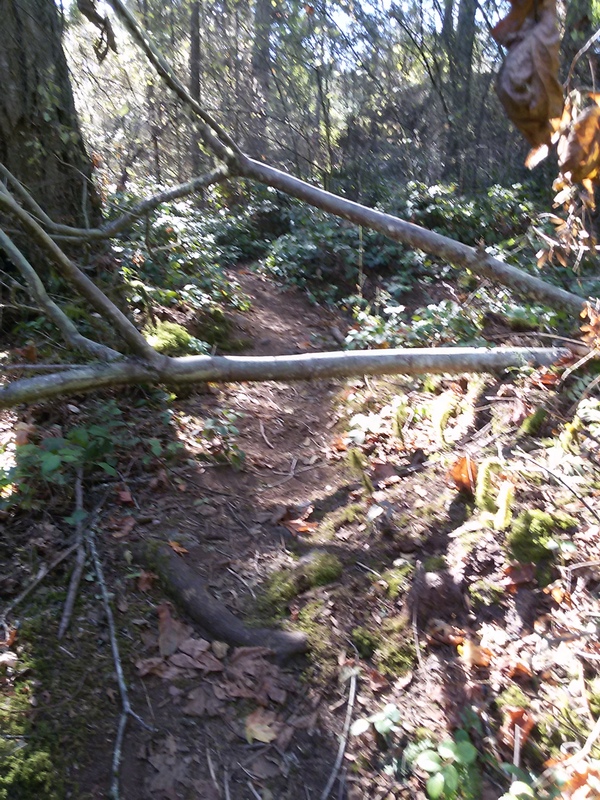 And yet in other areas well maintained attributes have been added to create trail enhancements. The trail eventually left the waterfront area then narrowed considerably in places with the footing not being as friendly as the more travelled section that I had just hiked, but still very walkable, just slower with more careful going required. A few obstacles here and there to clamber over or under made the hike interesting together with the odd deer or two poking their noses out. 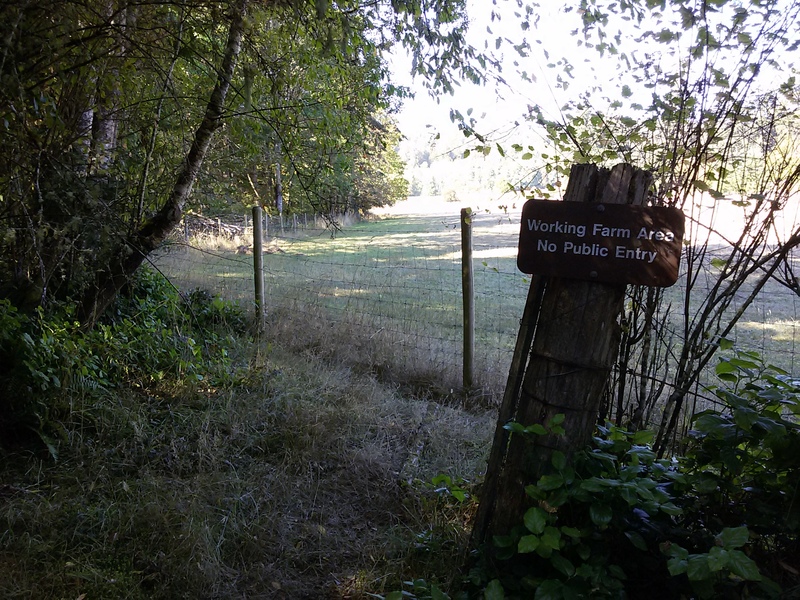 After Bear Point, the trail took me inland to follow the route around the working heritage farm that is Ruckle Farm. The farm is the oldest working farm in British Columbia and has been in operation since 1872 – 1000 acres were deeded to the Province in 1974 to create what we now know as Ruckle Provincial Park. The trail that I was on took me around the fenced area of the working farm all the way back to Beaver Point Road and the park entrance. Crossing over Beaver Point Road, I returned to my campsite via a field containing some of the heritage farms buildings that are still standing but no longer part of the working farm. The rest of the day was spent around my campsite where I watched the boat traffic on the water and a few deer that wandered very close to my site. 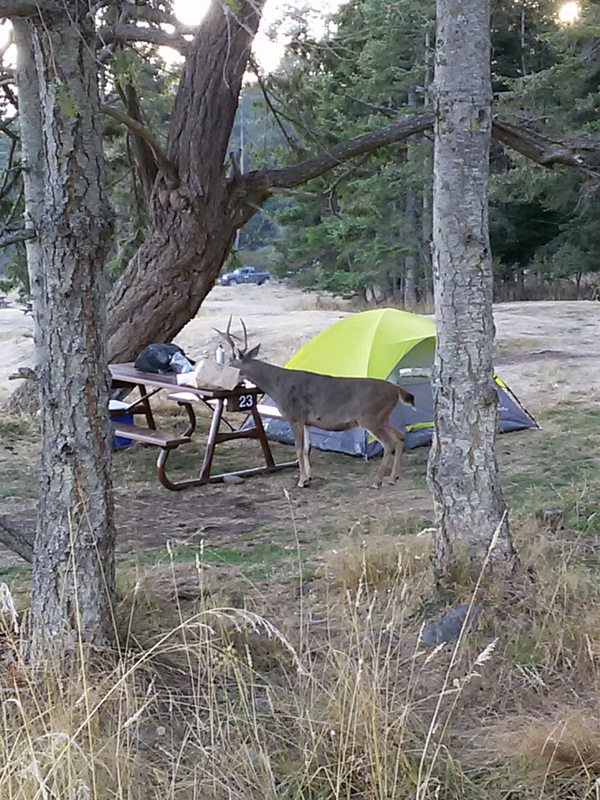 One brazen buck decided to rifle through a neighbouring camper’s items that were left on the picnic table – I guess that’s a good lesson on not leaving food out for wildlife! Otherwise, just relaxing after my walk – later I was rewarded with a spectacular sunset, which is also my featured photo at the top of this post. I really enjoyed my hike along the trail and did discover many peaceful areas of the park that I had previously been unaware of. 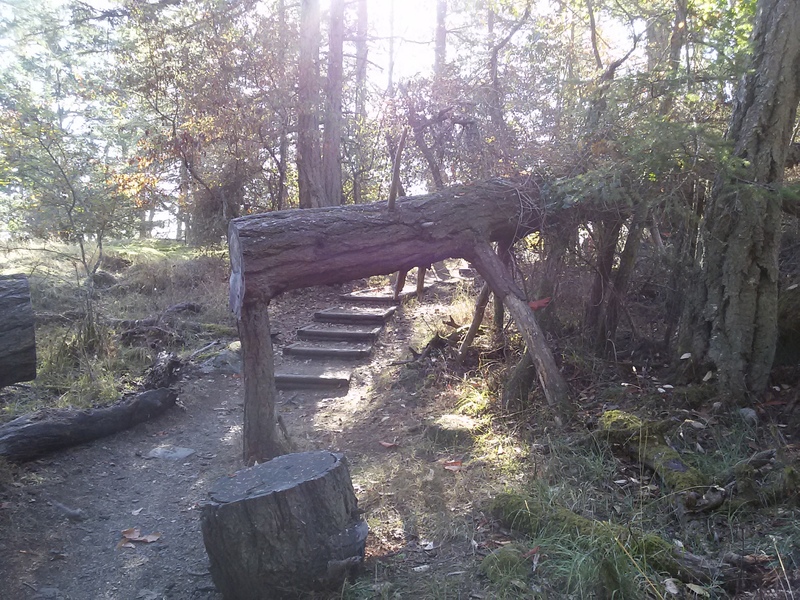 There are other trails available from Ruckle Park, but I left those this time for future adventures. AdamK & (Wow, that was a long walk!) Basil. 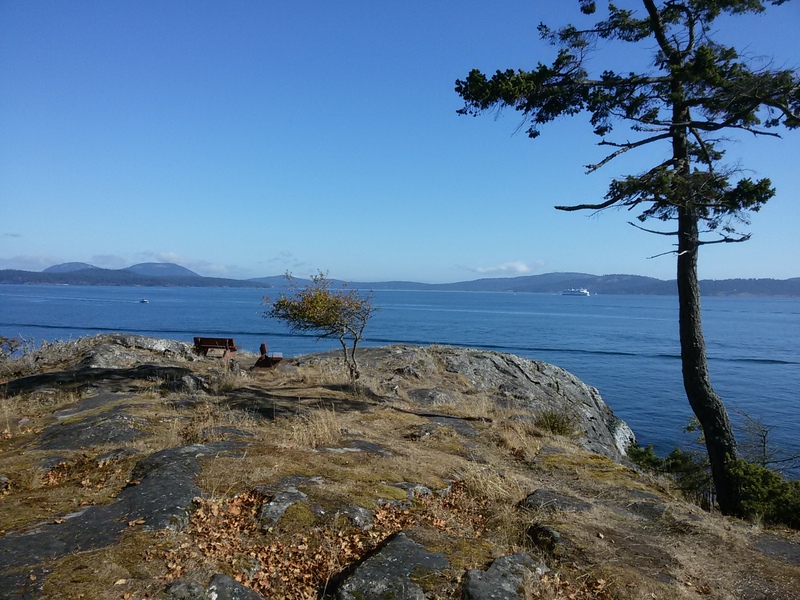 This entry was posted in Cycle Touring, Gulf Islands, Hiking, Saltspring Island and tagged BC Ferries, Camping, Ruckle Provincial park, Saltspring Island, Swartz Bay on October 28, 2016 by AdamK's Cycling & Travel.